Coming from an investment background, I can’t help but sometimes analyze NFL players for fantasy as I would individual stocks. 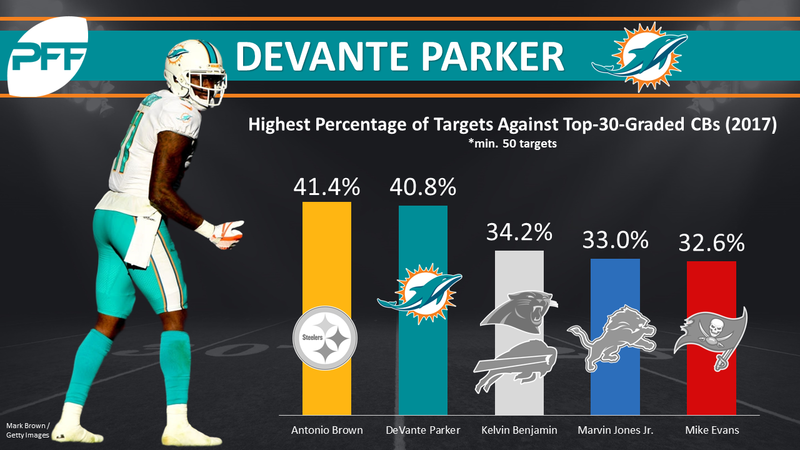 Perhaps this was why I was left scratching my head looking at the difference in average draft position between DeVante Parker (WR25) and Jarvis Landry (WR29) last summer. Despite having the higher ADP, Parker was coming off of fantasy-point-per-game finishes of WR53 and WR43, while Landry finished as the WR16 in back-to-back seasons. By every measure I typically look at when evaluating players, and especially the longer history of productive returns, Landry appeared to be the much better and safer investment at value – something of a blue-chip stock with a low price-earnings ratio, minimal risk, and an attractive dividend. Parker, meanwhile, would have been more of a speculative investment, with a high ceiling, low floor, and most of his price based on offseason hype. Of course, Parker finished the season well short of our lofty expectations, ranking 46th among wide receivers in fantasy points per game, while Landry was a home run, finishing fourth. Even when compared to fellow wide receiver Kenny Stills, Parker finished with 48.7 fewer fantasy points, despite seeing only nine fewer targets. Not only was Parker’s fantasy output underwhelming, but he was disastrous in terms of efficiency. Among all 51 wide receivers to see at least 75 targets last season, Parker ranked dead-last in passer rating when targeted (58.7). Among the same number of wide receivers, Parker ranked 12th-worst in yards per route run. In terms of expected fantasy points, Parker scored 3.2 fantasy points per game less than what the average wide receiver would have scored (third-worst at the position). As someone who was always skeptical of the Parker hype-train, I never expected to make excuses for Parker’s underwhelming season, but sometimes you find the stats – and sometimes the stats find you. Parker averaged 15.7 fantasy points per game and 76.7 yards per game across the team’s first three games (both more than Landry) before suffering a high ankle sprain the following week. During the remainder of the season, Parker averaged only 9.0 fantasy points and 48.2 yards per game. Parker would miss three games and spend the final two weeks of the season on the injury report due to this ankle injury. As I’m doing now, Dolphins OC Clyde Christensen would also in part blame Parker’s nagging injury for his poor play. In addition to Parker’s ankle injury likely sapping him of some of his typical agility, he also had the unfortunate drawback of facing the toughest cornerback schedule of any wide receiver not named Antonio Brown. In 2017, Parker and Brown were the only wide receivers to run over half of their routes against our top-30-graded cornerbacks. Parker and Brown were also the only two wide receivers to see at least 40 percent of their targets come against top-30-graded cornerbacks. Intuitively, it should be tougher to produce when lined up or in coverage against the best cornerbacks in the league, and the numbers back this up. Over the past decade, wide receivers average 0.31 fantasy points per route and 1.68 fantasy points per target against all cornerbacks. Against top-30-graded cornerbacks (by each season) those numbers drop to 0.27 and 1.45, respectively. At PFF we spend a great deal of time digging deep into wide receiver vs. cornerback matchups each week with our Shadow Matrix and WR/CB Chart. In the case of Parker and more middling talents, this level of research can go a long way, and especially in DFS. In the case of Antonio Brown, the league’s most cornerback-immune wide receiver, it’s wholly irrelevant. Over the past five seasons, Brown averaged 0.46 fantasy points per route against top-30-graded cornerbacks, which ranked best of 182 qualifying wide receivers over this span (Odell Beckham Jr. ranked second, Landry third.) 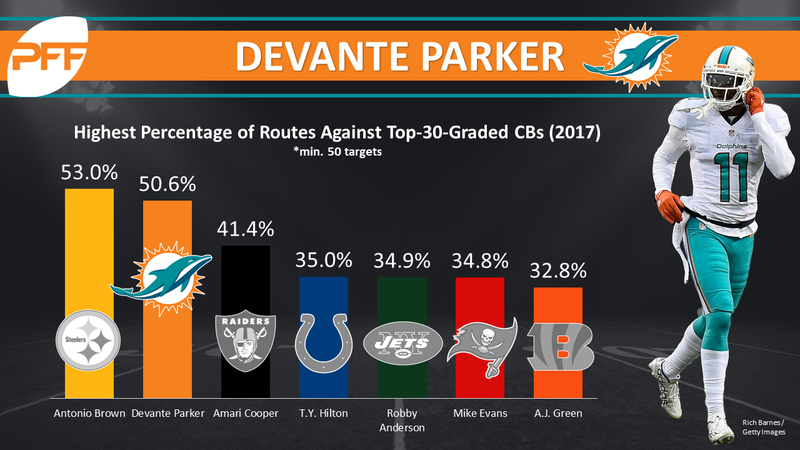 Parker’s numbers are respectable in their own right, ranking 57th, and this trend isn’t exactly new territory for him, as he also ranked top-five in percentage of routes and targets against top-30-graded cornerbacks across the two seasons previous, but I think it’s safe to assume this helped contribute to his underwhelming fantasy season. For Brown, this just makes his finish as the top-scoring fantasy wide receiver (21.8 fantasy points per game) all the more impressive. The question then becomes what to do with Parker in 2018. We should, I think, partly discount his poor performance due to injury and a tough schedule, but at the same time there’s little reason to suspect he won’t continue to draw top cornerbacks, and especially when in a division that sports two top-10-graded cornerbacks in Tre’Davious White and Stephon Gilmore. Parker ranked 17th in targets per game last year, and there’s cause for optimism that he may draw an even larger workload this season (with Landry an unrestricted free agent and current negotiations being as tumultuous as they reportedly are), but I’ll continue to remain skeptical on a player we have yet to see produce as the top option defenses are treating him to be. Current redraft ADP has Parker listed as the WR29, which is about where I have him in my early 2018 rankings (WR31). In dynasty, his ADP is far more compelling (WR28) and I’d be willing to try to acquire him at that price tag where I can.